What's the point of having a perfect vision if it can't be translated into reality? – This is why smartLAB, the intelligent laboratory of the future, combines both: innovative ideas, and technology that is practical enough for everyday lab use. 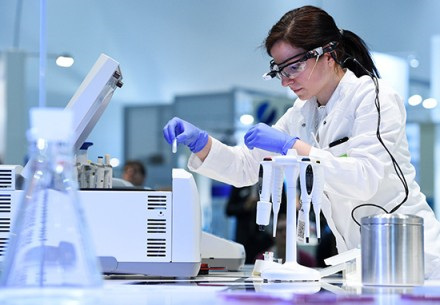 At this year's LABVOLUTION, which runs from 21 to 23 May, two use cases will show potential buyers what advantages and opportunities they can expect by upgrading their laboratories with smart technologies. Hannover. Together with networking, the optimization of laboratory workflows is one of the major themes of LABVOLUTION 2019 . For the third time, smartLAB once again forms part of the European trade fair for innovative laboratory technology, and offers trade visitors an exciting array of new features and an extended range of hands-on offerings. smartLAB is running a full program of events on all three days of the show, including lecture-style presentations, hands-on sessions, and platform discussions, as well as two use cases, which will be demonstrated in the morning and afternoon of all three days. "The use cases are designed to show visitors what working in a digitized laboratory environment might look like, and, more especially, what the benefits are," says Dr. Sascha Beutel, project leader for smartLAB at the Institute for Industrial Chemistry (TCI) at Leibniz University in Hannover. "In both use cases, the laboratory worker will be guided interactively through the various steps, while all the process data are documented fully automatically by the digital systems, thus helping to eliminate human error." The first use case is a bioreactor induction. Induction is a standard step in many biotech processing sequences, when microorganisms are stimulated, or induced, to form the desired end product. The advantage is that the microorganisms are left to grow naturally on their own to begin with, and only have to expend energy on the formation of the end product after induction. The second use case involves taking water samples in the field, which are tested by means of a colorimetric assay. The results are then analysed not by manual comparison with a colour scale, but with the aid of special lab glasses with built-in camera and an image-processing algorithm. The use of this technology greatly improves the comparability of test results. The water sample is then sent to the smartLAB. Here the sample is tested by means of PCR (polymerase chain reaction) and titration to determine its biological and chemical parameters. A new feature of smartLAB 2019 is the hands-on laboratory, where visitors have an opportunity to conduct a fully digitized workflow sequence themselves. This involves the preparation of a sacchariferous solution of known concentration, which is then tested by means of refractometric analysis. The visitor is given digital guidance at every stage of the workflow sequence, and all the relevant data are documented fully automatically. In addition to the TCI and Deutsche Messe AG, the partners of smartLAB include the commercial enterprises Eppendorf, Labfolder, Köttermann, PreSens, Schmidt+Haensch and Sartorius, as well as the Fraunhofer IPA research institute. New names recently added to this list are Mettler Toledo, iGo3D, Noack Laboratorien, Realworld One, and the Institute for Journalism and Communication Research (IJK) at the Hannover Academy of Music, Theatre and Media.